Although it doesn’t come up in every day conversation, when I tell folks I collect sports cards, I typically receive one of two usual reactions. Wait, when I think about it, I get three. The first is simply, “Why?” People who don’t collect don’t truly understand collecting and rightly so. 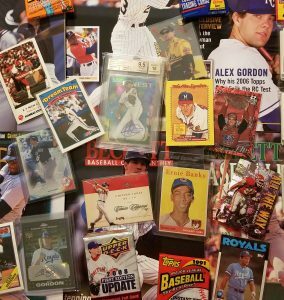 “Why do you collect pieces of cardboard?” That is a question I have heard more than once. “What do you do with them?” is another. Non-collectors don’t get it. But how could they? It’s not their thing. You have to possess a certain drive to collect sports cards or anything for that matter. It’s simple to begin by buying a pack or two of cards, but to really stick with it for a long period of time, you have to truly love it. Like many, I begin collecting as a child. The first one I ever bought was a 1988 Fleer Tim Belcher. To this day I remember buying it from a card store in PA. I looked through pages of nine-pocket sleeves, having no idea what I was looking at or looking for. I picked the Belcher because I liked the colors. I paid ten cents and I was certain it’d sell for a hundred times that when I was ready to go to college. All my cards were going to pay for college, right? The second reaction I usually get is something like, “I have a bunch of cards and they are really old! You should look at them sometime.” I say I’d be happy to look through people’s old cards, already knowing that it will be a bunch of late ’80s and early ’90s Fleer or Topps. The third reaction I get is, “You’re a woman and you collect sports cards? Not that there is anything wrong with that, but I’m surprised.” Last time I checked there’s no ban on women collecting sports cards. This hobby is male-dominated, but there are lots of female collectors out there. And from what I have seen, the numbers are growing.